Greg must deal with the world of middle school, and things don’t turn out like he expected. Greg (Zachary Gordon) is stoked to be starting sixth grade, middle school, leaving behind childhood and entering into the more mature, more socially complex world of adolescence. He is determined to be a “class favorite” in the yearbook. Despite the advice of his tormenting older brother Rodrick (Devon Bostick) to lay low and never do or say anything, Greg already imagines he ranks at a high 19 in popularity out of all the students. He ranks his sweetly naive friend Rowley (Robert Capron) in the pitiful 170s. 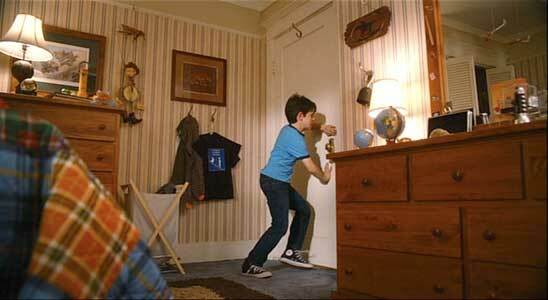 Adorable weirdo Fregley (Grayson Russell, the new Todd Bosley) ranks below the bottom at 201. School starts. Greg labels his peers as morons or idiots, and holds the social strata in equal regard. In gym, kids are divided into attractive (shirts) and less-so (skins), for instance. Shirts hunt the skins in a cruel (but funny) game called “Gladiator.” Escaping this, Greg and Rowley meet seventh grader Angie (Chloe “Hit Girl” Moretz), school reporter. 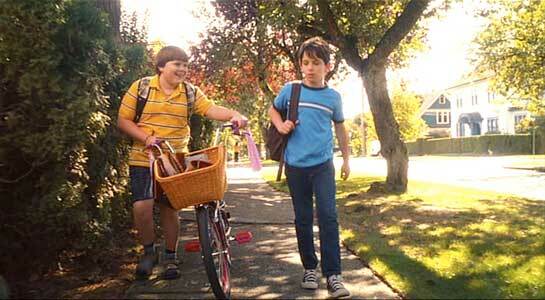 Rowley and Greg are walking home from school. Greg hopes to achieve easy popularity and success without doing any real work, because he’s so inherently great, by joining a club. He tries wrestling, and is paired against fierce Patty (Laine MacNeil), who hates Greg. “I can’t wrestle a girl,” he says, but she envokes Title-IX and ably defeats him. Greg next tries to be popular by simply dressing with style. This fails when Rowley decided to match him. After Rowley is forced change his image and wardrobe to meet Greg’s sense of acceptable, the two friends join safety patrol. This all felt like I was watching just another kids film where our cool hero is just a self-entitled jerk who hangs out with a sideshow of comic relief. More pandering. But at some point, marvelously, it becomes clear that this is exactly what the film is about! Greg is supposed to be this little jerk, whose motivations are disgusting and who increasingly becomes contemptable. Like everyone who asserts that everyone else is a moron (baristas, for example), Greg is inherently uncool and he’s discovering it! Greg finds Rodrick’s middle school year book hidden under his bed. Over winter, Greg accidentally breaks Rowley’s hand and is fairly unapologetic. More so, he’s bitter that suddenly girls and everyone else have discovered Rowley and like him for who he is: funny, nice, innocent, sincere. When an opportunity opens up for a cartoonist at the school paper, Greg hurtfully insults Rowley’s idea. And Rowley wins the gig! 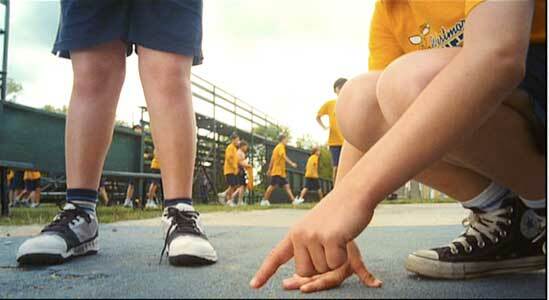 Amid this growing success, Greg allows Rowley to be wrongfully indicted for something that happened on safety patrol. Greg’s okay with this, mostly. When he finally confesses, Rowley, wounded, lays it out. “You’re a bad friend.” And that’s it. Now, Greg is motivated solely out of pettiness. He joins the school play, which goes badly (though he does have an excellent singing voice). He’s losing friends. He has no status. In the end, some bullies Greg and Rowley encountered over Halloween return. Payback involves a piece of cheese that has been rotting on the ground since time immemorial. In the end, in front of everybody, Greg gets to redeem himself with a single act of selflessness. A friendship is saved. It’s nice. When he and Rowley are discoved by Roderick, Greg runs into his room and locks the door. I couldn’t tell you if this is anything like the popular book series it’s adapted from, but I liked a lot of this film. It was smart, plenty funny, even intelligently so, and had actual insights. I especially liked what it wasn’t. There was no “edgy” humor (Booyah! Talk to the hand! ), no product placements, it wasn’t hyperactive, no fart/poop jokes (the lowest denominator), the soundtrack wasn’t packed with ready-to-buy awful singles, gross-out jokes were spare, small roles were filled with real actors and not C-list has-beens bringing out their moldly old schtick. I was delighted. I only wish this film had more conviction about its sharper insights. It was content to just present characters, lay out its story and resolve. It’s very straight-forward, and lacks any greater sense of consequence. Maybe that works best for a kids film. Like all the best flicks from our childhood, they’re simple joys that we later discover are much more complex than we could have known back then. I would definitely recommend this for families and kids. I wouldn’t directly recommend it to jaded, 27-year-olds like me as a dry rental. I would say that if they did get the chance to watch it, they wouldn’t be surprised. Greg ends up paying the price for his bathroom escapade. 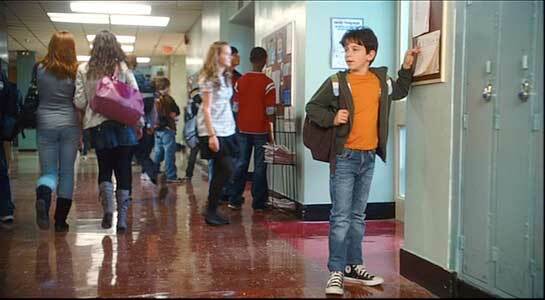 Greg is tricked into thinking he is late for school by Rodrick. 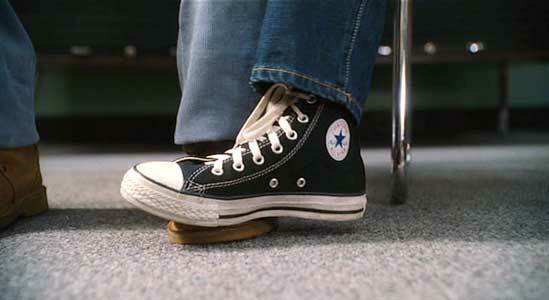 Throughout the film, Greg wears black high top chucks and they’re frequently shown. 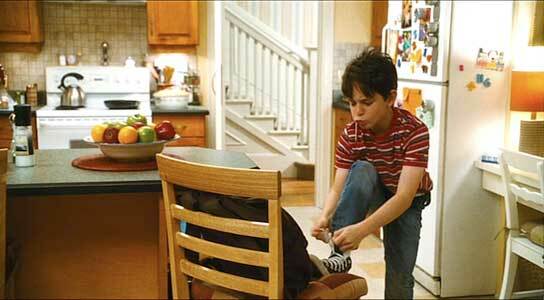 In the opening, Greg, tricked by Rodrick, gets ready for school by dressing, having breakfast and brushing his teeth all at once, including lacing up his chucks. Greg steps on Rowley’s foot to get his to not complain about missing class when they join the safety patrol. Rowley and Greg look at the grossed out piece of cheese on the playground. Diary of a Wimpy Kid. (2010) Zachary Gordon, Robert Capron, Rachael Harris, Steve Zahn.